I will be pinning these on our Pinterest this week as part of being a featured post! SO FOLLOW US ON PINTEREST! Also, if you were featured please remember to pick up one of our featured buttons in the tab at the top of the page! We want you to be able to take the button back to your blog and show it off that your great work was featured!! 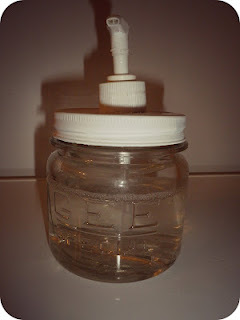 NZ Ecochick showed us the coolest Glass Soap Dispensers that she made for her kitchen and bathroom. I think they are so cool. I have been seeing so many new ways to use glass containers and I just love it. Her blog is awesome. If you are interested in living frugally, growing your own food, crafting, organizing, OR NEW ZEALAND... you should go check her out. She offers awesome ideas from these dispensers to recipes like curried eggs or banana jam, or simply organizing.. she has such a wide variety of things to offer you as a reader- I would definitely check her out. Thanks for sharing this awesome creation, NZ Ecochick. Pamela at Inspired by Felicity shared with us her Date With Herself that she has every morning. How could I NOT love this one? She sounds like a woman after my own heart... just in different order. She talks about how she enjoys her fruit tea (which I would love to know where to get that) and kettle corn each morning while checking in online before she hears the creak of the door and her daughter Felicity comes out. She tells us how her first reaction at hearing the door is "Darn, my time is up" but as soon as she sees Felicity's smiling face she doesn't mind the interruption. THIS IS ME every morning. I quietly try and get ready to get downstairs to have 10 minutes to just ME before hearing my boy open the door and the pitter patter of his feet. Some mornings I feel the SAME way... but as soon as I see his sweet face and messed up hair I am wanting my good morning hugs! As far as the popcorn... I have a secret indulgence with air popped popcorn during nap time. You, my friend, are not alone! THANK YOU for sharing! 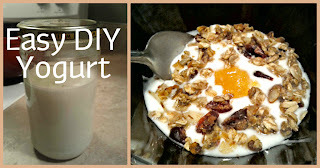 Our sweet friend at Romance on a Dime shared with us a great recipe for HOMEMADE Yogurt. I am so excited to see her recipe. My best friend has started making her own, but hearing her talk about it has really intimidated me from making it. The recipe shared at Romance on a Dime seems so easy... so cheap... and so yummy. Who wouldn't want to do this? I am going to make it a priority to try this awesome recipe this week! Thank you so much for sharing and helping make me a little less intimidated by yogurt making. Liz over at Imagine Remix is a new friend as of last week, and I just love her stuff! This amazing side table redo really caught my eye. For one I just LOVE maps! I don't really know why, but maybe because they remind me of all the people in the world and how God has a plan for each one of us and loves each one of us. I think inside I feel something like that when I see maps, it is kind of unexplainable. But when I saw this table I fell in love! Like seriously if I saw this at a store I would HAVE TO HAVE IT! It looks so professional and I can't believe she made it with a laminated map that she had! 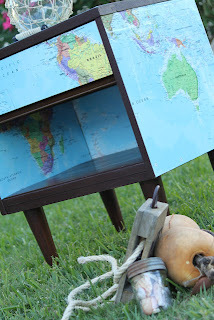 Anyways, stop by and give our new friend some blog love, and enjoy this side table as much as I do! When this fun project from Lisa at Condo Blues was linked up I was very surprised and excited. The night before I had just bought a wine crate similar to this from Sam's. I was so excited, but.....I had NO idea what I would do with it! I loved her ideas. First she made it into a dog toy box. 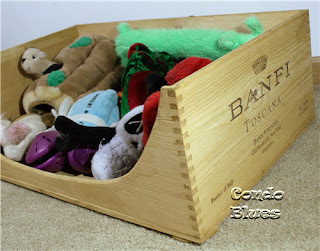 (Which right now my dogs toys sit under the shelf of our entertainment center, so this would be a great idea for me! ), and then she showed how to make a cute dog bed out of it! It was a great post, and very helpful for me since I was trying to find ideas for my own wine crate. I haven't made up my mind of how I am going to use it yet, but Lisa gave me some great inspiration to start with! 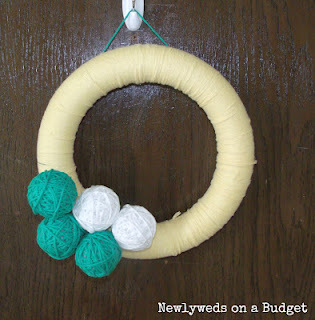 One of my wonderful blog friends Kari from Newlyweds on a Budget has a monthly craft night with another great blogger, and this month they decided to make something Pinterest inspired. And if you have been on Pinterest you have probably seen some pretty cute wreaths that are similar to this...either with yarn, or fabric balls. Either way, they are too cute! I just love this summer wreath, such a fun idea and such easy supplies to use! If you know anything about me, you know that I love wreaths! I wish I could make tons of wreaths year round, but instead I just have to find fun wreaths from great blogs like Kari's, and share them with my readers. Stop by to learn about all of Kari's fun DIY projects and crafts...she's great! So now it's time for this week's party! 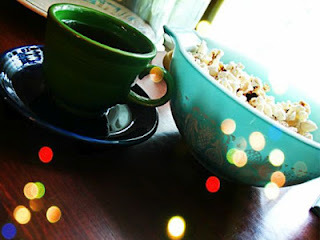 Have fun and hang out with others ;-) Visit other blogs and make new bloggy friends! Then come back here and LIKE their posts! We want to see any and everything that you are up to! From Home makeovers, craft projects, DIY, recipes, tips, kids games or crafts, or anything else you are up to!! Please SUBSCRIBE to our blog on the left sidebar! Also, we have moved our Naturally-Nifty Party Buttons to the top tab, so take one of those and put it on your blog or add us to your linky parties tab on your blog! And please stop by our FACEBOOK page and like us there and follow us onTWITTER too! Newer PostHOOAH! I am a fireman! Older PostDream Sheet? What is a Dream Sheet? !